Multimatic was founded in 1984 by Peter Czapka, the son of one of the founders of Magna Corp. The company is called Multimatic after the original name of Magna Corp.
Multimatic is worth an estimated $1.3 billion and is privately owned. Multimatic Motorsports is the racing arm, and races in both IMSA and GT endurance. The Aston Martin DB10 that James Bond drove in the movie Spectre was built by Multimatic. Ten working cars were created just for the movie at its facilities in the United Kingdom. 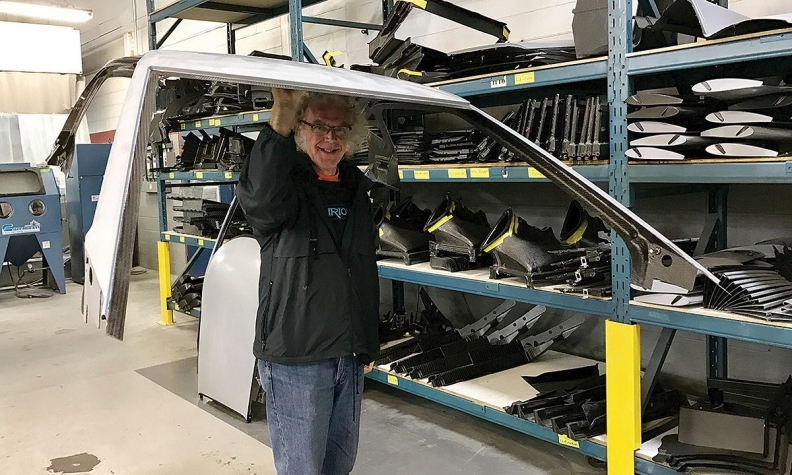 Larry Holt holds up the lightweight carbon-composite roof of a Ford GT at Multimatic's Markham, Ont., headquarters. Most of the car is made from such composites as opposed to metal. It's October 21 and Larry Holt paces his office at Multimatic Inc. headquarters in Markham, Ont. 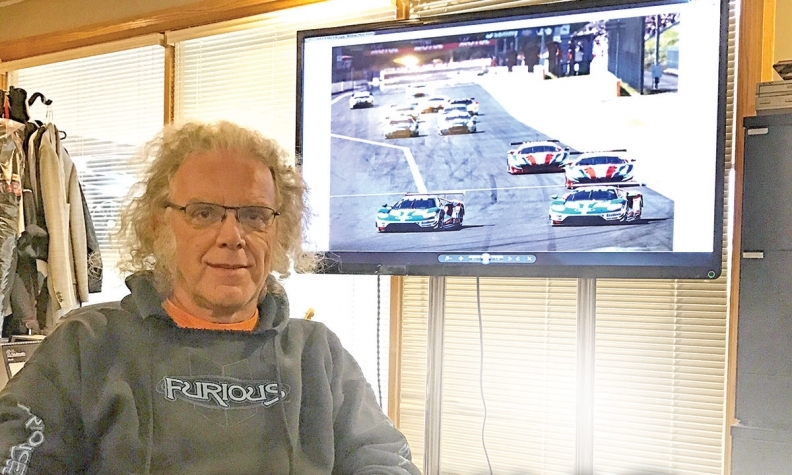 His mind isn’t on his company’s induction the next day into Canada’s Motorsport Hall of Fame. Rather, it’s absorbed with ensuring a reliable supply of high-quality, low-volume parts to build about 1,000 of Ford’s globally anticipated GT supercars. “We’re a supplier of parts to the industry, so you’d think I’d be sympathetic to suppliers, but I’m not,” says Holt, 58.“There are 6,000 parts [in the GT] and if we’re missing just one, then we don’t have a car. “Right now [as release dates loom], the challenges aren’t coming hour by hour; they’re coming minute-by-minute. “You’d think suppliers would be lining up to sell us parts for a supercar, but they’re not. They line up to sell 800,000 pieces a year for an F-150, but when it’s 250 pieces a year . . . that’s just not a priority, even if they are high-quality pieces that cost a lot of money. It seems ironic that Multimatic was inducted into the Hall of Fame as an international member. “Multimatic is a fiercely proud Canadian company,” CEO Pete Czapka relayed Oct. 22 to the audience in a letter read on stage by Holt, the company’s vice-president. It might seem like a long way from the racetrack to the GT’s production line, but Multimatic employs about 3,000 people around the world with more than half in southern Ontario. Much of the company’s business comes from the things most people never think about, such as manufacturing door hinges and suspension systems; Multimatic has become known for its high-quality “mechatronics” that power automatic doors, trunk lids and even retractable rear wings. Now the company has been thrust into the limelight as the builder of the GT, which is in the last stages before production release. Every car in the initial two-year run of 500 is already sold while another one-year production run of 250 has since been promised by Ford, with a fourth year expected (though not yet promised) which would bring the GT’s total production run to 1,000 units. Motorsports has brought the wider fame, however, and the highlight came in June when the Multimatic-built Ford GT won the GT LME Pro Class at the 24 Hours of Le Mans endurance race in France. It was the 50th anniversary of the GT40 taking the top-three spots at Le Mans, and the pressure was on the new GT for a victorious return to the circuit. Unlike most performance cars that are developed into racers, the GT track cars and road cars were designed at the same time. Raj Nair, Ford’s vice-president of product development, sold the concept to his board in 2013 as a halo sports car, but he really wanted it to win Le Mans. That meant little time to develop the GT and certainly little track practice. “We were brought in because, right in the beginning when Raj and I talked it through, we really hit it off,” says Holt. “I told him it needs to be a composite chassis and he agreed. “McLaren is (composite), Ferrari is not, Porsche is not, Corvette is not; it’s time for Ford to embrace composites. Multimatic specializes in making carbon composites and has created such exotics as the Aston Martin Vulcan and One-77 at its U.K. research and engineering facilities. Those are street cars, but the Ford GT also had to win Le Mans, literally out of the box. The initial team of 14 in a Detroit basement became about 300 people – half Ford and half Multimatic – before the GT became reality. The road car has plenty of race in it because there was no time to develop separate engineering for the major components, says Holt. The road car has a race-approved roll cage, for example, incorporated into the carbon-composite tub, because the engineers could only create one design for both the race cars and road-going cars. was developed right alongside the race car. It has a different suspension, but not that different, and it’s surprisingly comfortable.